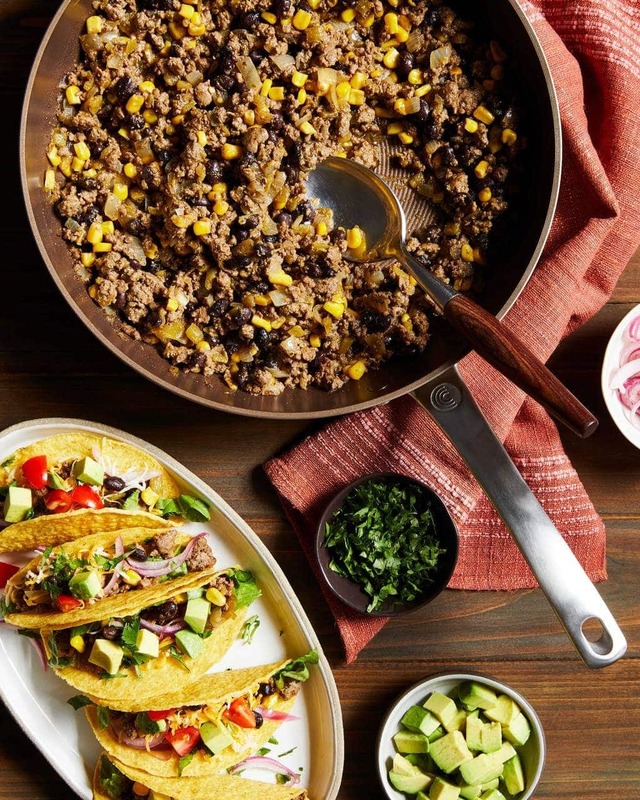 Green Chile Beef Tacos with black beans and corn are a one-pan meal perfect for a Game Day party or a weeknight dinner. 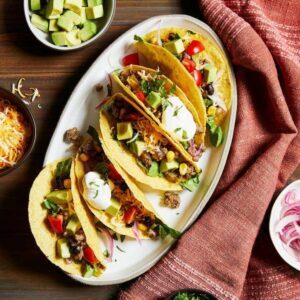 These tacos come together in minutes in your nonstick skillet. Crispy green chile and beef tacos in crispy shells save me the step of pulling out extra tortilla chips! That extra crunch of the shell makes every bite satisfying. And I certainly love that these crispy shells hold all the tasty toppings I can imagine. These tacos are a fast and crowd-pleasing recipe for a game day party. Make a platter and let the football fans top their own. Enter for your chance to win a Circulon Ultimum skillet. See below for details! This post may include affiliate links and is sponsored by Circulon. All opinions expressed are my own. For more information please see my disclosure agreement. 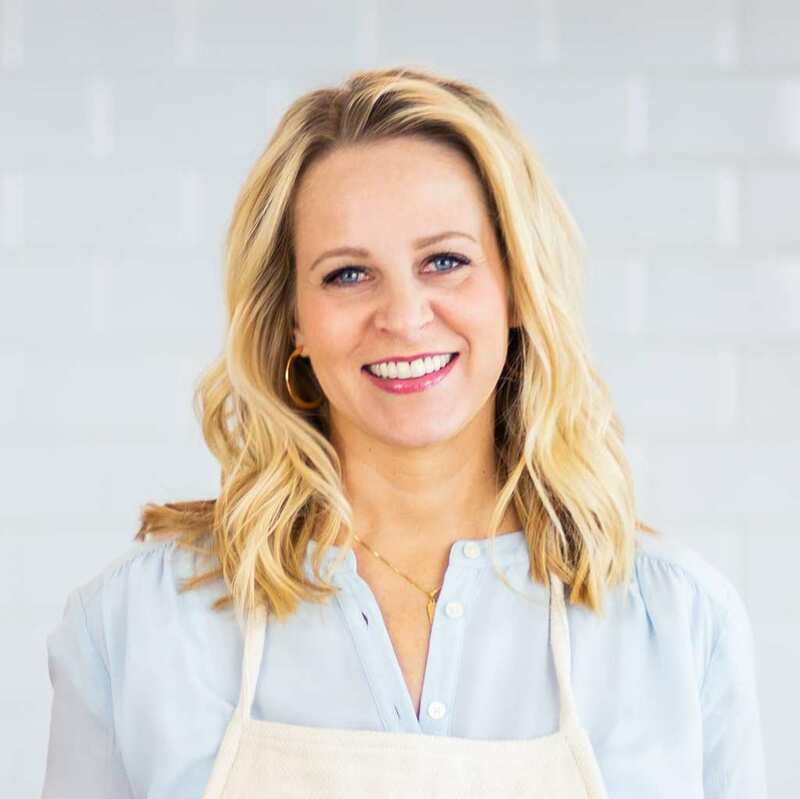 I love a good taco, so I was happy to add to my collection of go-to taco recipes with this one. They usually come together pretty fast, and make for an easy dinner. Try my Corn Chorizo Tacos, Low-Fat Slow Cooker Carnitas Tacos, or my Fish Tacos with Mango Salsa. 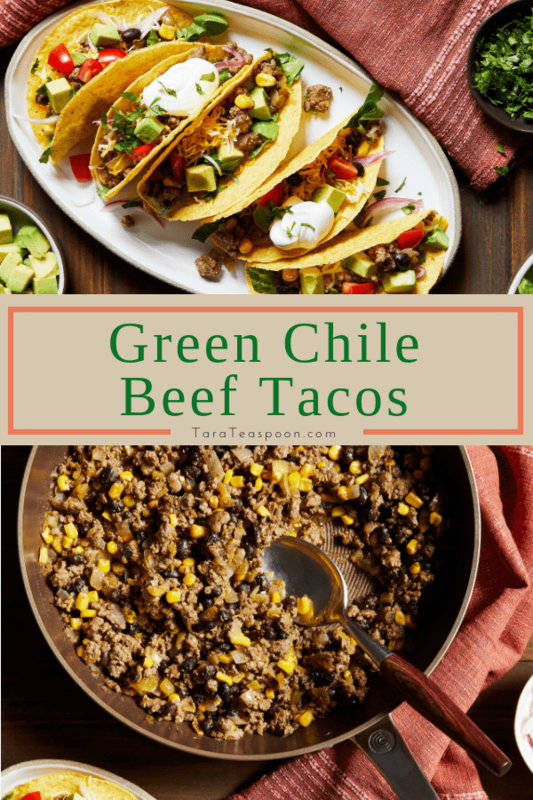 These Green Chile Beef tacos take just minutes to put together when I cook them in my nonstick, covered Circulon skillet. It’s large, at 12 inches, so it is perfect for browning my ground beef. The beef cooks evenly and quickly because of the generous surface area. I often cook ground beef, chicken or turkey in a nonstick, high-sided skillet. I like that I can break it up and get it cooking in no time, rather than stirring piles of it in a smaller skillet. High-sided skillets are great because I’ll end up tossing in my other ingredients, and the tall sides hold all the deliciousness. A regular skillet also works, I just end up with piles of my food sliding off the sloped sides onto my stovetop! 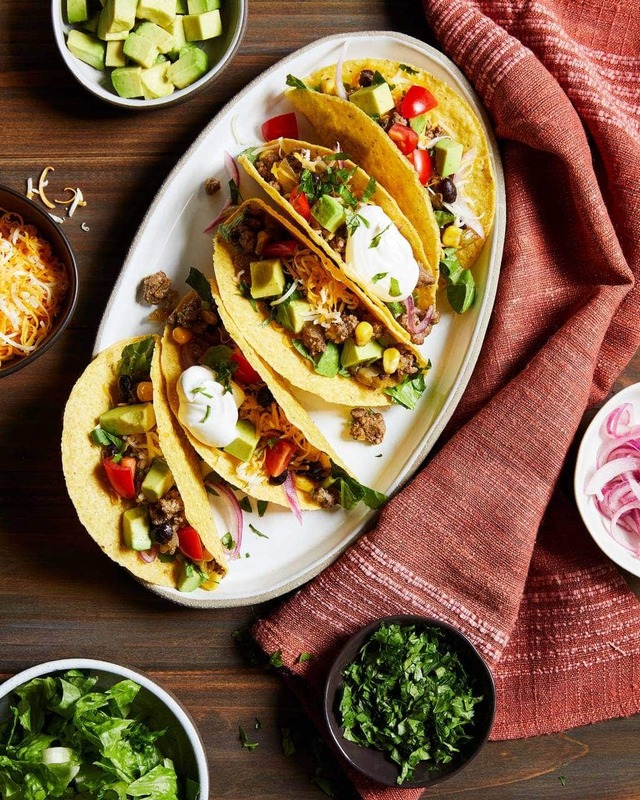 The fastest way to put these beef tacos together is to use my Circulon Ultimum Cookware. It’s their latest line in this forged, PFOA-free nonstick cookware collection. Mine is in the Nutmeg color, but these pans also come in black. 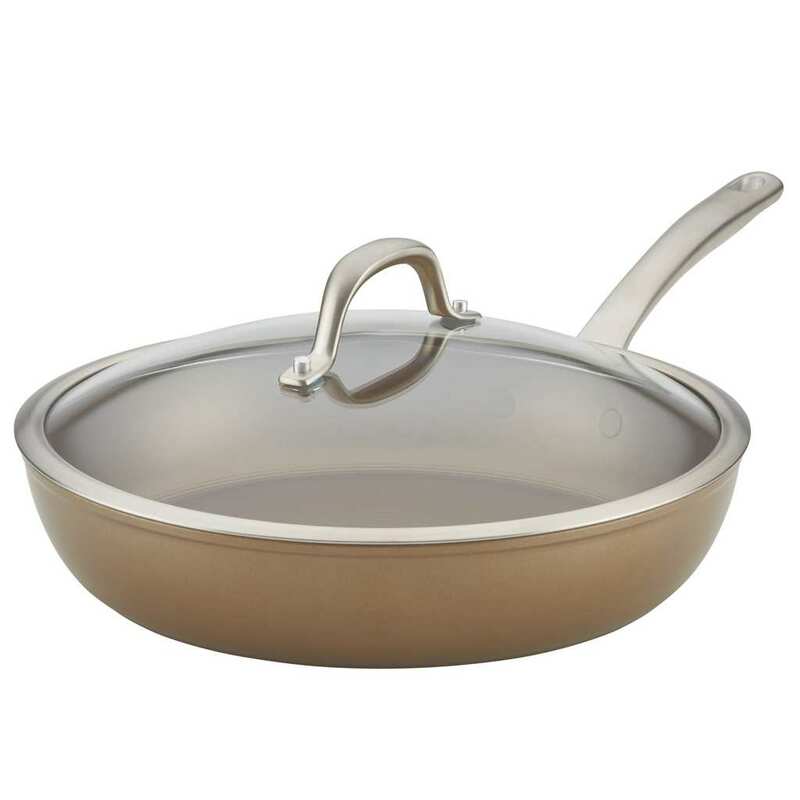 I am super picky about my non-stick cookware and always look for PFOA-free. The Circulon pans are also metal utensil safe. A huge deal for me because I don’t have to reach for my wood or plastic spatulas, I can use any tool that’s handy. Cooking with Ultimum nonstick means nothing sticks to the bottom of the pan and all the caramelized bits stay right on each piece of food. I can also use less oil when cooking with nonstick for the same reason. The raised circles on Circulon in particular, allow food to release from the bottom of the pan much easier than a flat, smooth surface. This taco filling is also great for taco salad. Simply swap the crunchy shells for chips and friends can make their own plate. In a large 12-inch Circulon skillet over medium-high heat cook ground beef, onions and garlic until beef is cooked through, breaking up into small pieces with a spatula, about 10 minutes. Great for a game day party, family gathering or weeknight dinner. Save the leftovers and have a taco salad the next day! Rules and Regulations for the Circulon Instagram Giveaway! Dates of Entry: Friday, January 18 through Monday, January 21 at 12pm PST. Terms and Eligibility: No purchase necessary. Open to all legal residents of the continental United States and the district of Columbia, 18 years of age and older, who have an active Instagram account and current U.S. shipping address. 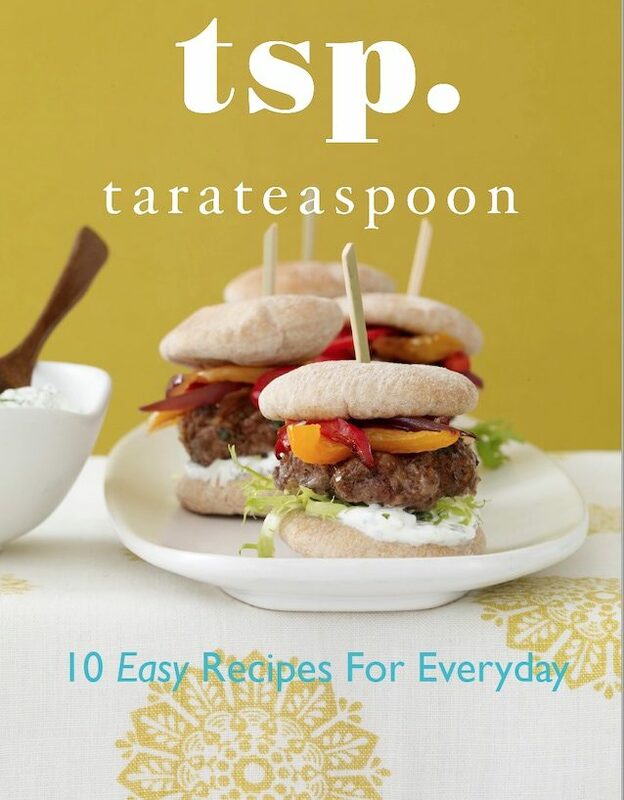 Winner must be following @tarateaspoon on Instagram and follow all the official rules. Void where prohibited. One (1) winner total with one (1) prize per winner. Prize valued at $69.99. The winner will be notified via Instagram message or be tagged in an Instagram post and will need to respond with name and shipping address within 48-hours or another winner will be picked in their place. This promotion is in no way sponsored, endorsed or administered by, or associated with, Instagram. Official Sweepstakes Rules: To enter, participant must follow @tarateaspoon on Instagram and tag 2 friends with legitimate Instagram accounts. Entries will be verified. Spam and accounts looking for giveaways will be invalidated. Accounts that follow/unfollow for giveaways will be invalid entries. Odds of winning vary by number of entries. Winner will be picked at random. Recipe and Styling by Tara Teaspoon. Photography by Ty Mecham. 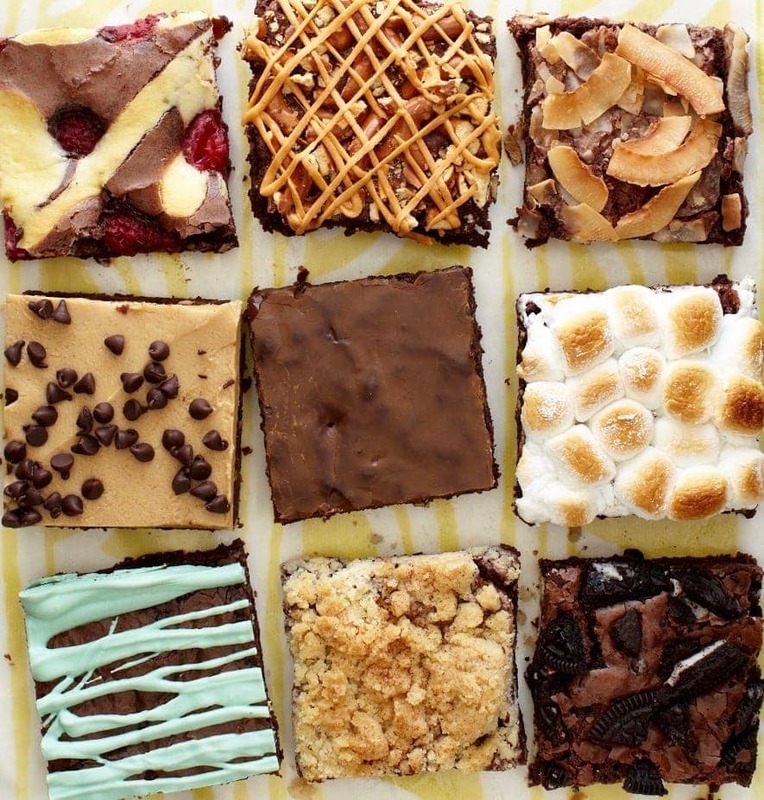 This recipe is so perfect! My husband and I bring food to work and are always meal prepping. 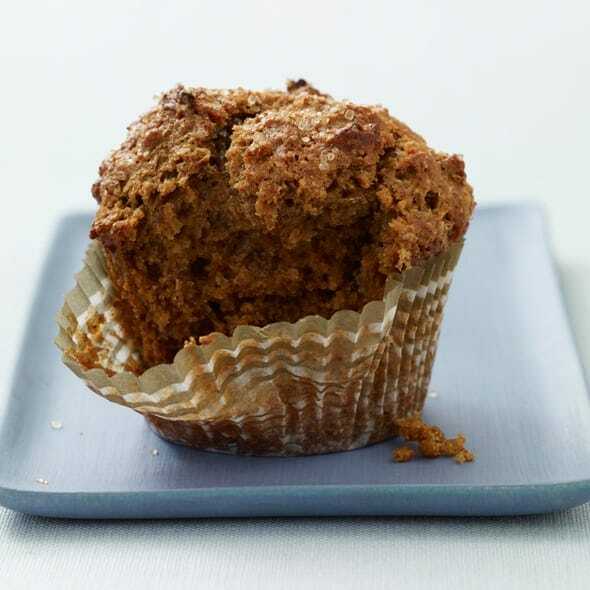 We’re on the hunt for new recipes so we’ll add this into the mix! Can’t wait to try it! These tacos look amazing. My family has them at least once a week so I’ll have to use this recipe next time. I love using circulon cookware. I have a saucepan and it’s i so awesome to use. Plus, i think they sell it at costco which is a plus. Anyways, these tacos sound incredible – the flavors are all so great together! Okay first off these are so instagram worthy! Second I need to try these tacos they look amazing! I have not met a taco I did not devour. These sound delicious. I know my family would love these next Mexican night. Nothing beats Taco Tuesdays (or any day for that matter)! I’m always looking for new ways to make Tacos, so giving your recipe a try. I was literally just saying how it’s been too long since I’ve had tacos. I love tacos and I’m a big fan of spicy foods – the fierier the better – so I think I’d fall in love with these tacos. One-pan meals are perfect, especially Mexican. Half of my family can’t have corn, but I will just make two pans. It till saves me so much time in my busy schedule. 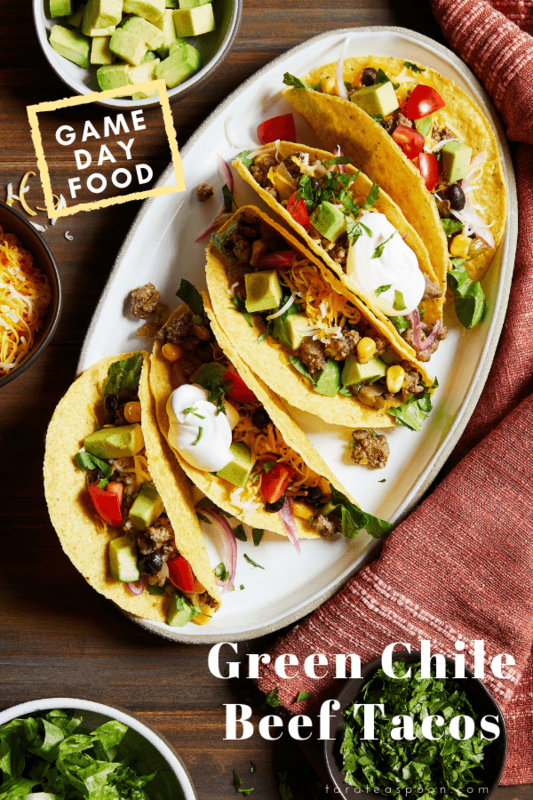 I always have so many of those cans of green chilies around (I can’t help but pick them up at the store) and these tacos sound like a delicious way to put some of them to use! My eldest daughter loves beef tacos. She’ll definitely love these. 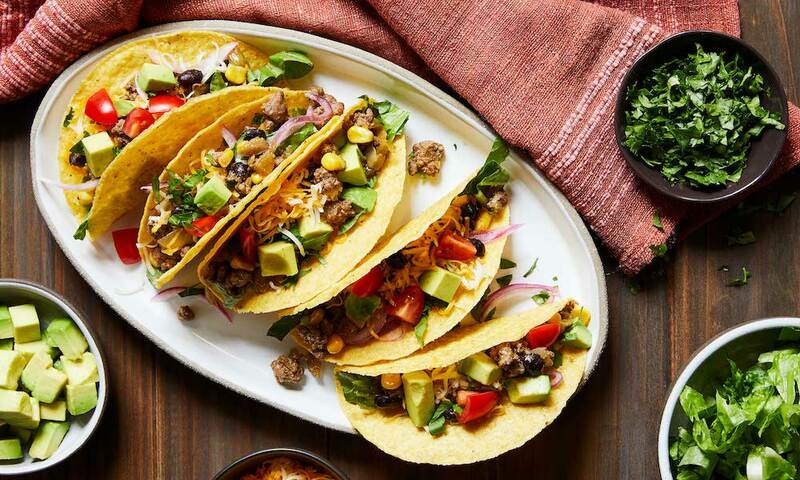 Ground beef, black beans and corn is such a magical taco combination! 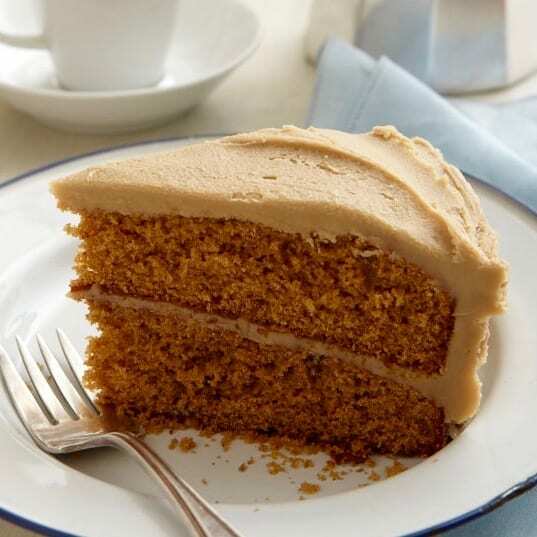 This looks fantastic, just what I want now (and it’s 9 AM…) Thanks for the recipe! I’m always down for a good taco recipe. I’ll have to add this to my Super Bowl menu. Thanks for sharing! Your green chili beef tacos look fabulous. I love the look and sound of that skillet too! Sadly I live in Italy so can’t enter the giveaway! I love the chilies, corn, and beans added to the meat. I love the texture of the mixture in my tacos, and I love the flavor it adds. Thank you for the inspiration! These green chile beef tacos are going to make the perfect weeknight meal that my entire family will enjoy. I LOVE that I only need to use one pan and it is done quickly. No way I can wait until Taco Tuesday to make these! Taco Monday is totally happening! Holy moly, this recipe looks great! I love tacos of all kind and these are no exception! Love that it only takes one pan too! They are totally incredible! And yes cook up so easily in the Circulon pan.